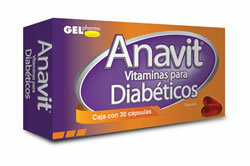 Anavit vitamins help in the prevention and treatment of vitamin and mineral deficiencies in diabetic patients. Anavit contains vitamins and minerals that can help the well-being and health of men and women with diabetes. What are the ingredients of Anavit Vitamins? What are the main benefits of Anavit vitamins?